In the 18 years that boberdoo has been a company, we have seen the leads industry change in many different ways. For such reasons, being up-to-date and flexible with so many different verticals is a necessity. This is why the ability to use buckets and affiliate pixels with web campaigns is something that we consider to be important. Bucket campaigns are good for determining "who brought this lead to my form?" and paying them out in a dynamic, as opposed to a static, way. The basic way to deal with affiliates and forms is on a per-lead basis, which is when a lead fills out a form, the affiliate's SRC is grabbed. Thus, when the lead is sold, the affiliate is paid each time. Bucket web campaigns allow a "bucket" to be filled every time a lead is sold, eventually being dumped out when the amount of money that leads sell for hits a certain number. Bucket web campaigns would not be able to work without affiliate pixels being fired. What happens is, there is a form on the landing page where leads are generated. There is a SRC (source) allocated with the affiliate, so every-time the form is submitted by a lead, you know which affiliate is connected to it because the lead will have their SRC. Sometimes the affiliate obtains a lead though another person or wants to differentiate certain paths the lead takes; this adds a Sub_ID and is applied when the lead fills out the form. For example, a publisher/affiliate helps generate leads on your website/form. You both agree that every lead they generate on the form is split 60/40. So they get someone to go to your form and fill it out. Then it sells in the boberdoo system to a buyer for $10; they get $4, and you get $6. Now let's say that an affiliate wants to know when a lead is sent to your form through a Google ad vs. a Bing ad vs. a Facebook ad. A unique Sub_ID passes a value for Google ad, compared to the Bing, compared to the Facebook. In turn, each ad would have its own bucket from the same SRC: for example, Sub_ID=GA, Sub_ID=BA and Sub_ID=FBA. When the SRC is submitted, possibly with a Sub_ID, a bucket is created. One SRC can have multiple buckets, one for each Sub_ID, such as: Sub_ID=1, Sub_ID=2 and Sub_ID=3 all with the same SRC. Once the bucket is filled by the amount of money that leads are sold for, the bucket is "dumped out." Buckets can also be "dumped out" when a set amount of time has passed, if the affiliate sets up their campaign to run that way. Bucket web campaigns can be used for any vertical really, but mainly tend to live in payday, auto warranty, health insurance and auto services. Although, all verticals are moving towards the dynamic ability of buckets instead of the static per lead method. Payouts are moving more in the bucket direction also because of the wide range of price points that leads sell at. For example, there are some leads that sell for $20 and others that sell for cents. Before starting bucket web campaigns in the boberdoo system, the affiliate pixel needs to be created. This is set up on the affiliate's side of things. Pixels and tracking can be explained here if you are interested in learning more. 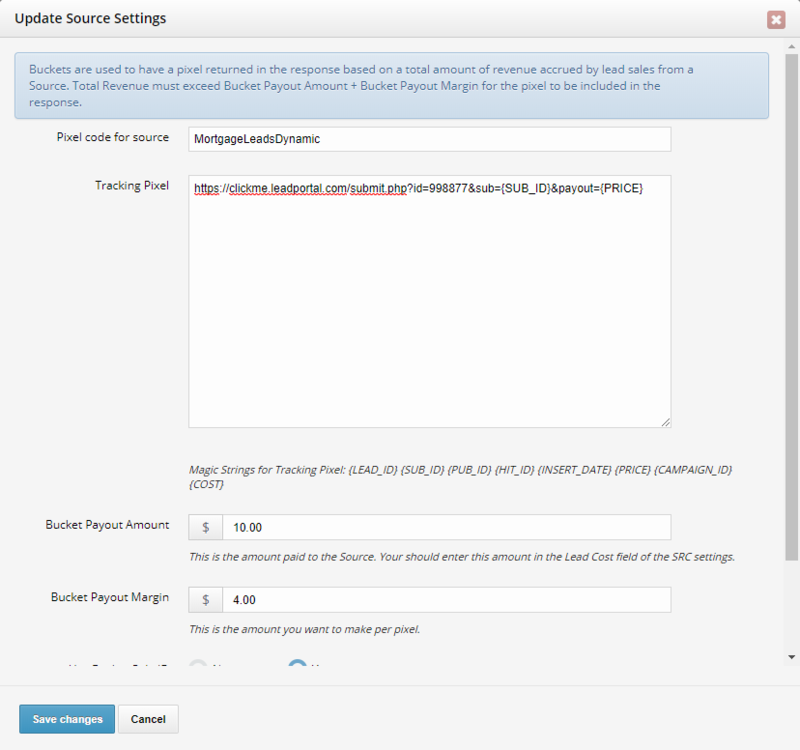 Forms also need to be set up, either on the affiliate's side or through the boberdoo form builder. Once these are set up and have been run, the results of how many dumped buckets, whether scheduled or not, can be ran in a report, under boberdoo reports. The leadlog can also show results, such as the full pixel based on Lead_ID. Leadlogs do rollover after so many months, because boberdoo does not store information past a certain date, depending on location and the type of information. Buckets, however, do not expire, even though the information is not kept past a certain date. If you are interested in learning more about bucket web campaigns, set up a demo above to see them in action. For those of you who are current clients, submit a ticket so we can talk more about setting up bucket web campaigns for your account.